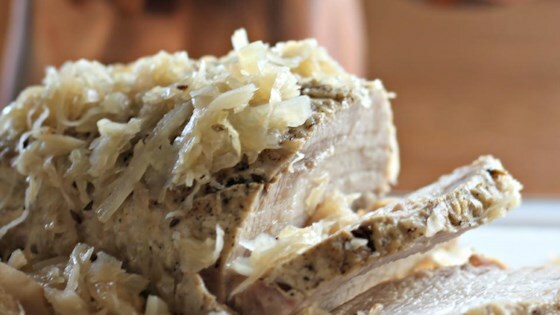 "Old fashioned pork and sauerkraut that is served here on New Year's Day for luck! Serve with mashed potatoes, and apple sauce for dipping the pork in." Cut pork loin, if necessary, to fit in the slow cooker. Season with caraway seeds, and salt and pepper to taste. Pour sauerkraut over the roast. Cook on High for 1 hour, then cook on Low for 5 to 6 hours. Internal temperature of the roast should be at least 145 degrees F (63 degrees C). This was quite delicious, the only thing I did different was to brown my pork roast before putting it in the slow cooker, otherwise it was the best roast,tender,moist,and just wonderful.